Hello lovely readers, I am Anjana from At The Corner Of Happy And Harried. I am so glad to be guest blogging at your lovely blog, Agata. Thanks a bunch for the opportunity! 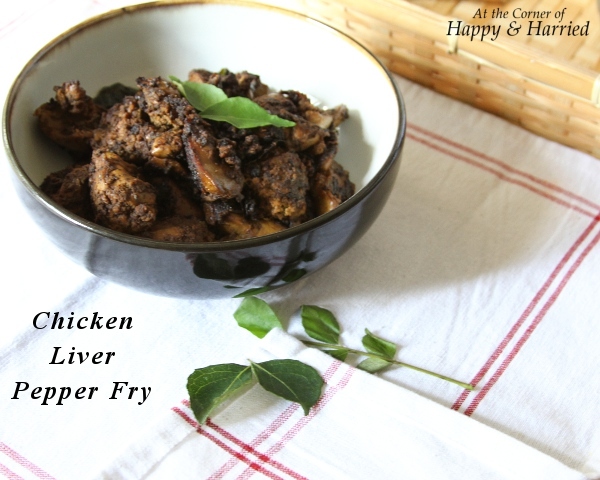 Today I bring you a spicy and delicious recipe from southern India – chicken livers cooked in a spicy masala and finished by pan frying with a dash of black pepper. Don’t be put off by the long ingredient list. The method is pretty simple and you can find all these items at your nearest Indian/Asian store. This dish is my husband’s absolute guilty indulgence. He can, and usually does, finish it off in one sitting! Have it with a cup of steamed white rice or Indian flat breads like rotis or naan. Provide a fresh green salad on the side and you have a lovely meal! Clean the chicken livers. To clean them properly, combine a teaspoon of turmeric powder in a cup of milk and immerse the livers for at least 15 minutes. Drain the liquid, wash them under cold running water and cut them in to medium-sized pieces. This is the best way to clean the livers and helps to get rid of the slightly bitter taste. Meanwhile, heat oil in a pan. Add the mustard seeds, red chili flakes and curry leaves. When the mustard seeds start sputtering, add the onions and saute till they turn golden. Now add the ginger and garlic paste and green chilies. Saute well till the raw smell is gone. Add all the masala powders and salt. Saute for a minute and add the chicken livers. Mix well, cover and cook. You may not need to add any water, since a lot of liquid comes from the livers. But keep checking once in a while to see if it needs a sprinkling of water. Check seasoning and add more salt or pepper powder if you want. Add a teaspoon of lemon juice and remove from heat. Serve hot with steamed white rice and curry or Indian flat breads like chapathis, rotis or naan. Goes well with warm tortillas and a fresh red onion salad too! 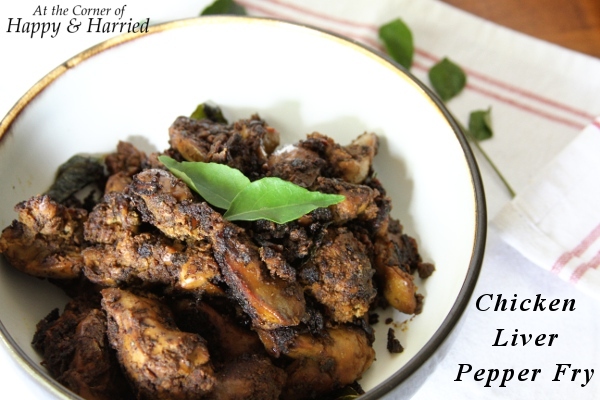 Have you tried chicken livers? Do you like it dry or curried? 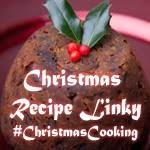 I hope you enjoy this lovely recipe. And do pop in at my blog here . I would love to have you over. You can also find me on Facebook, Pinterest and Bloglovin’.